(Nanowerk News) One of the most common complaints about solar power is solar panels are still too expensive to be worth the investment. Many researchers have responded by making solar cells, the tile-like components of solar panels that absorb and transfer energy, more efficient and longer lasting. But even the longest living solar cells that most effectively convert sunlight to energy will not become common if they are prohibitively expensive. Therefore, Professor Yabing Qi, the head of the Energy Materials and Surface Sciences Unit at the Okinawa Institute of Science and Technology Graduate University, has a different idea: make solar cells using a type of semiconductor called perovskite materials, which are, in Qi’s words, “dirt cheap.” If solar cells are cheap enough, Qi reasons that people will want to use them for the immediate payback in energy savings. Now Professor Qi and members of his research unit have developed a new method for making perovskite solar cells worthy of attention, and The Royal Society of Chemistry published their findings September 5, 2014 in their journal, Energy & Environmental Science ("Fabrication of semi-transparent perovskite films with centimeter-scale superior uniformity by the hybrid deposition method"). Professor Qi suggests that his new, semi-transparent design for solar cells could allow windows to generate energy from the sun. Qi’s new method uses what he calls hybrid deposition to create perovskite solar cells, made from a mixture of inexpensive organic and inorganic raw materials. In addition, his solar cell is about a thousand times thinner than a silicon solar cell, and therefore uses far less material. Qi estimates that for the same price, he could either buy raw materials to build 1000 square meters of his solar cell, or he could buy about 20 wafers of crystallized silicon, to build 0.16 square meters of traditional solar panels. In contrast, the hybrid deposition process uses less energy to produce a solar cell at a far lower temperature. 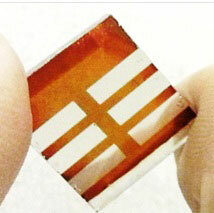 In fact, Qi envisions manufacturing the new solar cells using a low-cost printing process. The process would deposit the materials onto thin sheets of PET plastic very quickly to make large quantities of cheap solar cells. Qi does not yet know the limits of his hybrid cells, but optimists in his field hope that they could reach 20% efficiency. This means that that the solar cells will convert 20% of the energy they absorb from the sun into usable energy, which is comparable to the best silicon solar panels on the market. Professor Qi and members of his research unit developed a hybrid deposition method to produce perovskite solar cells. 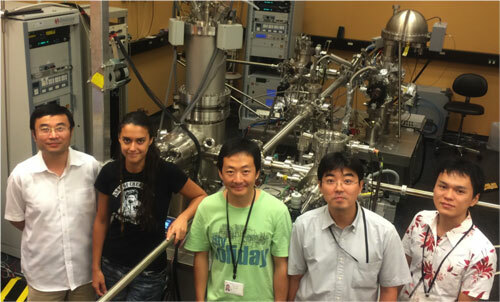 From left: Yabing Qi, Sonia R. Raga, Shenghao Wang, Luis K. Ono, and Yuichi Kato.